350 Bay Area is made up of a dynamic team of volunteers who not only help do the work, but lead the initiatives as well. 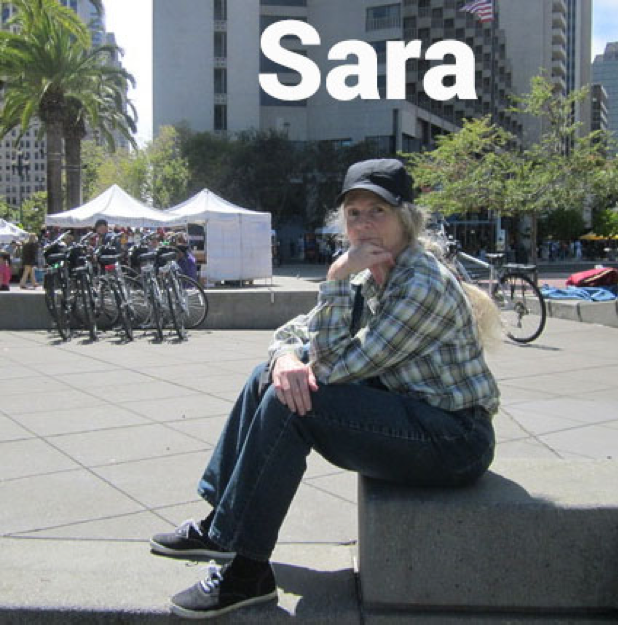 One of these awesome activists is Sara; read about her work and passions below. I got tired of stressing about the climate. Action is the best antidote to this kind of stress. 350 San Francisco: I’m on the coordinating committee of 350 San Francisco and also on the 350 Bay Area Transportation Campaign. Generally this means I go to meetings, write some letters, and sometimes make phone calls to representatives or go to a public board meeting and tell officials it’s an emergency dammit. Also I post articles and announcements on web pages. When there’s a demonstration or that kind of event, I help make signs and things. It is solely about climate, and it joins with other groups in taking real action to slow the rate of climate change. I’m very encouraged by the growing realization among all sorts of people that we need to use a lot lot less energy. More and more people are now talking about how we need to adjust everything, including the number of kids and grandkids we’ll have. When the climate movement hits reversals and it’s clear that we’re not progressing fast enough, another thing that keeps me going is to think of the people who were enslaved here for generations – the people whose great-grandparents were slaves and whose grandchildren were also slaves, but who kept on holding together a community that would survive. Some suggest I do amazing things with potted plants and flowers.